Here is Makers Local 256's version of what we are thinking of doing. Should be extremely reliable. QA / field testing should be fun. Should be extremely simple, require no skills (programming, unix, etc.) to change settings, add or remove access. Buzz in system connects directly to lock and uses simple two conductor wire and a button. This system limits failure to one door at a time, is very modular. Do they have enough range? Read that Jeenodes at 100m line of site or 30m indoors. Lower baud-rates improve range. What would the power situation be like? Power off of wall-wart, possibly with battery recharge for power-outage. What are the failure modes? it seems like you'd want to always leave the door openable by key for the best failure protection. 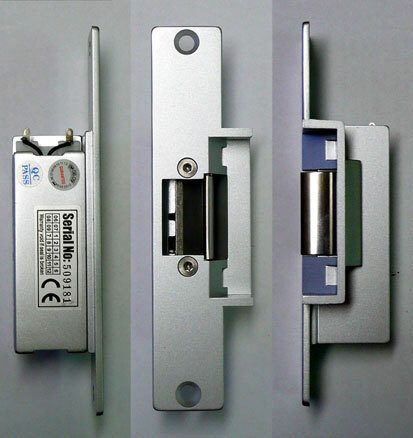 electronic strikes work by unlocking the part that keeps the door in the frame. The bolt going from the door is always unlockable by key. One wire between door and router, second wire between router and server, and always on door server. As few "moving" parts as necessary. No ethernet alternative: signal boards via simple copper wire from central web server. plus: no ethernet shield cost. node server (running dyn-dns or similar) authenticates users and then sends command over serial to a usb-attached arduino/similar peripheral. peripheral sets signal lines high for corresponding node devices. 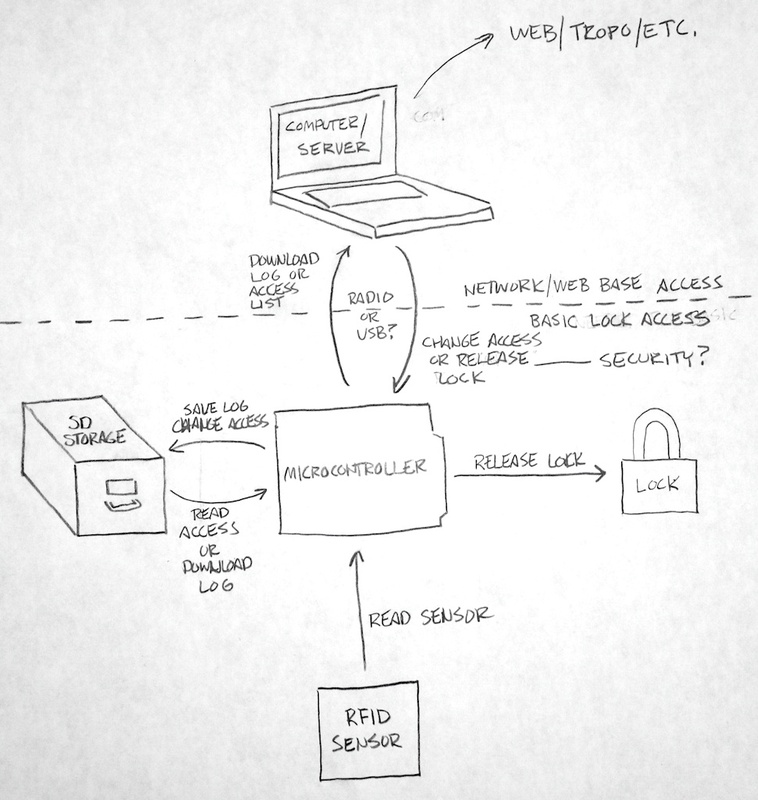 Node devices open door locks. What are the money and time costs of using a pre-packaged solution? Generally, it seems like a good idea to keep normal door operation the same once the unlocking system installed. Doors have been slowly engineered over the years and work very well in the case of crowds, fires, etc. Electric strike works well for this, additional actuation also as long as it doesn't require that it be used to get in our out. for bar-style door (http://shrten.com/424), a servo motor would keep the door function the same but allow you to trigger opening from outside. servo force would need to be pretty decent to push the bar in. $75-$110 would buy a hefty enough servo (http://www.servocity.com/html/hsr-5498sg_servo.html). there's also a potential for very clever solution possibly involving a counter weight, some gearing, etc. Keypad -- doesn't have to look like an atm keypad. could be a rotary dial (http://www.porticus.org/bell/images/buttset/dial.jpg) or a set of crazy lost style knobs/switches. ideally they'd be self returning/position-less though so that once the door was opened, the code to open it couldn't be discerned. Here is a possible diagram of how the system might work. Suggestons as to changes or modifications? This page was last edited on 1 December 2010, at 15:50.